A hockey player’s gloves are his slinkiest piece of gear. To some hockey players, smelly gloves are not a bad thing and instead are a symbol of hard work. Some players use a smelly glove as a weapon against opponents in a maneuver called the “face wash” in which a player rubs his gloves over an opponent’s face. When that stench is too much for you to handle, though, it is time for deodorizing damage control. Hang your hockey gloves on the end of a broomstick as soon as you get home from practice or a game. This allows air to circulate inside the gloves so that the gloves dry and do not become a breeding ground for the bacteria responsible for hockey glove stench. Deodorize and disinfect your hockey gloves by spraying them inside and outside with a disinfectant spray to kill bacteria, especially such bacteria as Methicillin Resistant Staphylococcus aureus. Use a disinfectant spray sold at sporting goods stores for hockey gear or a general household disinfectant spray. Whichever disinfectant spray you choose, check the label to ensure that it is effective against MRSA. The Environmental Protection Agency lists disinfectant products that are approved for use against MRSA. Hang the gloves back up to dry after you spray them. Clean your hockey gloves like the pros by taking them to a commercial sports equipment cleaner. Some people launder their gloves at home, but this is not a good idea because laundering hockey gloves in a home washing machine and hand washing them in a tub of soapy water allows too much water to get into the inner foam parts of the gloves, making the gloves susceptible to mold growth. Sports equipment cleaners use specially designed equipment to clean and disinfect the gloves without damaging them. Ask your local sporting goods store to refer you to a sports equipment cleaner, if you do not know of one. 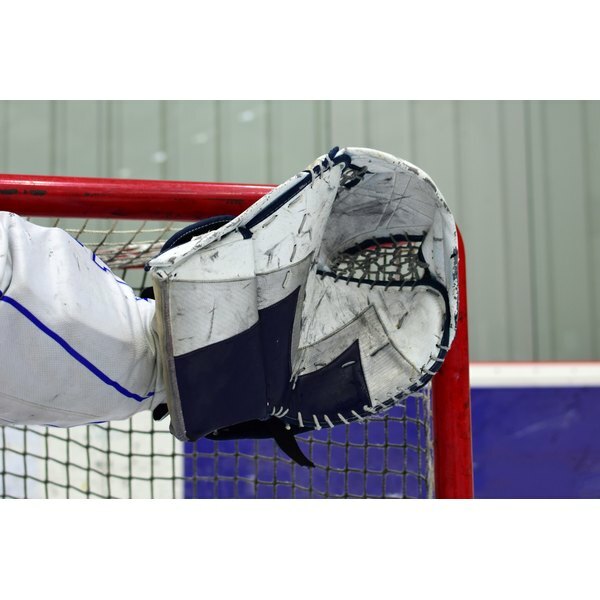 Keeping your hockey gloves dry is one of the best ways to minimize odor and prevent the growth of bacteria. Players in contact sports have an increased risk of developing MRSA and other multi-drug resistant bacterial infections due to the frequent close contact between players with skin injuries, according to a study published in the Journal of Athletic Training. Regular use of disinfectants helps minimize the risks of contracting dangerous bacterial infections.